Prepare Your Records & Respond to any IRS Audit from the Convenience of your Home Computer! 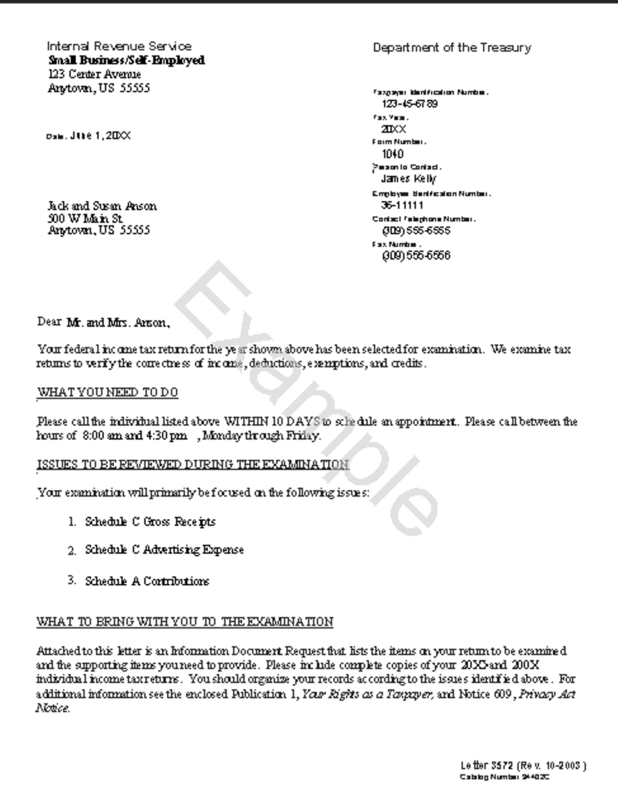 The IRS uses Letter 3572 to inform you of an audit. They often use this form when they want to visit with you in person - either at your home or business or in their office. At any time, you may contact the TaxHelp Tax Attorney, J. David Hopkins, JD, LLM for advice! The IRS could have outlined the issues on the front page of the Letter 3572 but they often use Letter 3572 in conjunction with Form 4564 or a Form 886A to request information from you. It is very dangerous to meet with the IRS. So, before you contact them please look at the Form 4564 or Form 886A you received to find out what to do next to save time and money! The IRS will want you to answer their questions. They will likely want your bank accounts & income evidence but more often, they want deduction proof from you - and the burden is on you to prove your case. So, you must get your evidence in order and get legal advice. But, you also must prepare your case for the least cost. So, TaxHelpAudit.com is designed for you to self-prepare for an IRS audit & TaxHelpLaw.com is ready to give you Tax Attorney guidance! It is wise to prepare your own documents. You have the access & authority to get the records required, like no one else. If the IRS questions relate to Schedule C or Schedule E please purchase and follow the TaxHelpAudit Business Program. If the questions relate to any other Form or Schedule please purchase and follow the TaxHelpAudit Individual Program. To see how the TaxHelp Programs work see our Empowerment page! Lost Documents: You may fear an IRS audit because your records are lost or unavailable or you didn't keep your documents. However, unless you only used cash, you can re-create bank records & credit card records. Even if cash was used, affidavits can be obtained or we can use industry standards to arrive at a reasonable figure. See Lost Documents. At any time you may consult with a tax attorney from TaxHelpLaw to get more specific tactics for your case!